"Fort Rajwada, Jaisalmer is an ode to the Rajputana hospitality. The luxury resort offers a memorable experience of the Golden City of Rajasthan. Designed in traditional decor, the resort offers a range of contemporary luxuries. Sprawled across six acres of land, revel in the breathtaking interiors, delicious culinary delights, appetizing drinks, relaxing massages at the Spa and gracious traditional hospitality. Fort Rajwada treasures the finesse of Jaisalmer, ranging from mesmeric landscapes, artwork, and gastronomy. 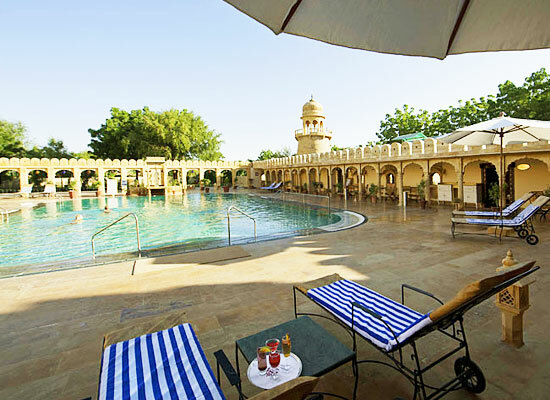 The Rathore Family manages the resort creating the perfect experience of Jaisalmer and its pleasures. Fort Rajwada offers accommodation in choices of 90 rooms, 4 mini suites and 5 suites, the epitome of Rajputana hospitality. The luxury resort is designed in the elegance of bygone days with convenience of the contemporary times. 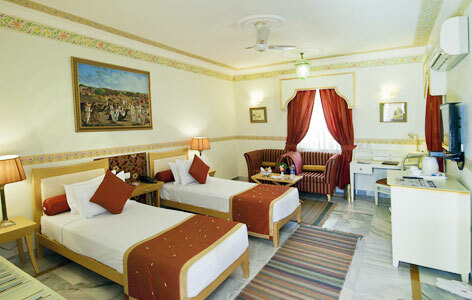 The Deluxe room features contemporary facilities in its Rajasthani style décor. Plush beddings in King size beds or twin size beds are available. Enjoy royal hospitality and the pampering comforts. 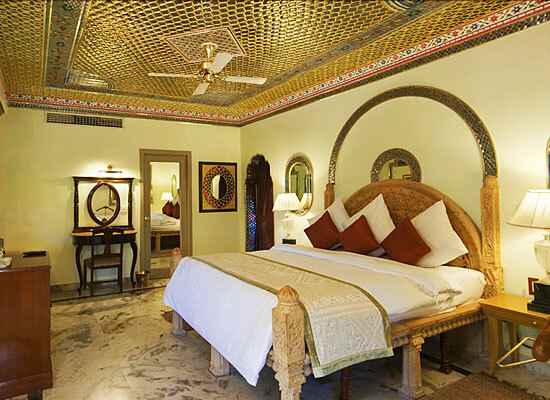 The super-deluxe room overlooks the Jaisalmer fort, offering indulging luxury to the guests. Rajasthani style furnishings with the latest facilities, King size beds or twin size beds, en-suite bathroom, closet and entertainment facilities are some pleasures. The executive suite is decorated to create the days of the Rajputana warriors. These spacious rooms come with seating, in-room dining section and a comfortable King size beds or twin size beds. Modern facilities add to the comfort of guests with en-suite bathroom, closet space, entertainment facilities, etc. Deluxe executive suites offer premium experience of the luxury resort. Enjoy the plush King size bed, spacious bathroom, entertainment facilities and all modern amenities equipped in the suite with a traditional décor. View the golden hued Jaisalmer Fort in its magnificent glory and enjoy the comforts of the deluxe suite. This opulent Suite is decorated in imperial Rajasthani architecture, reminiscent of the palatial rooms of Rajput royalty. A comfy seating area, separate dining area, two spacious bathrooms, plush king size bed, these suites truly imitate princely lifestyle. 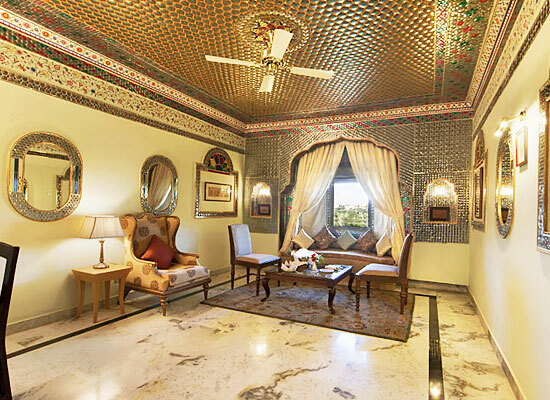 Local artisans have decorated the room as the earlier generations serviced the Rajput Royalty in similar fashion. The modern conveniences have been integrated in the rational décor offering a matchless experience. Sheesh Mahal, the Mirror Palace is a room whose walls have been made of designs created from small mirrors embedded into the walls. This room re-defines "Living like a King". Separate seating spaces, dining room, and king size bed in the bedroom, en-suite bathroom with bath and other facilities are the paramount of Royal Experience. Revel in the luxuries fit for a king on your stay in Fort Rajwada. The all-day summer dining restaurant serves breakfast, lunch and dinner. The 75 cover multi-cuisine restaurant offers Rajasthani, Indian & European delicacies. The fine dining restaurant uses organic and local produce to offer the best of what Rajasthani cuisine has to offer. 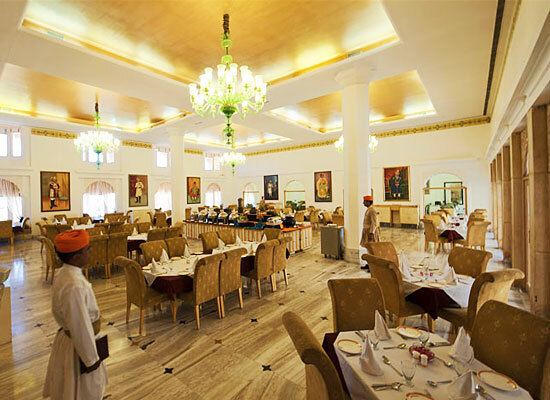 The luxurious interiors add to the imperial experience of dining the mouthwatering fare of Rajasthan. Relax with tantalizing drinks, taking a dip in the pool, watching local folk performance, feeding on fresh kebabs at the pool side barbeque. It creates a heavenly experience of unwinding all your stress. Relish cocktails and a range of delicious Mughlai, Chinese and Continental snacks in the lively Patty bar. Relax at the end of day or after dining, with the Jaisalmer Fort in the backdrop and the best choices of food and drinks. 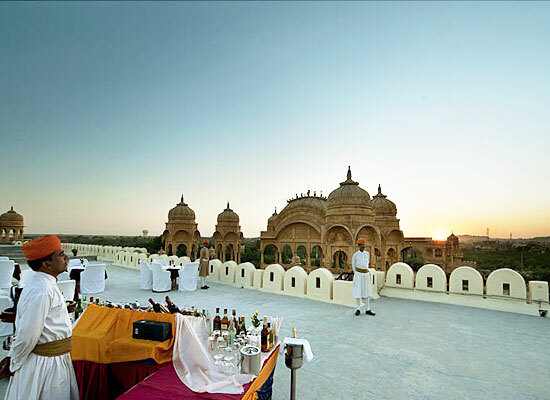 The Roof-top Sunset bar is the ideal place to enjoy the splendor of the sun setting behind the magnificent Jaisalmer Fort and the Thar Desert. The beautiful bar offers a range of appetizing liquor and snacks while rejoicing in the exquisite natural beauty. The Roof-Top Sunset Bar & Restaurant, later in the evening, is also an ideal spot to enjoy a romantic dinner with your loved one under the star-lit Jaisalmer Sky. Jaisalmer was founded in 1156 A.D. by Rawal Jaisal, the chief of the Bhati race of Rajputs. This town boasts of some of the beautiful and intricately carved temples and Havelis.